Each panel is about the size of a regular piece of paper,making it perfect for traveling or outdoor activities,especially when it is folded up into its convenient -to-carry form.Plus,its mounting loops allow you to easily attach it to your backpack or any other location. 12 Month Worry-free Warranty At Chafon,we are committed to provide high quality products.If you need assistance with our products,simply contact Chafon and our friendly customer service team will assist you. High Conversion Efficiency:40W/0.053Hp solar array, convert up to 18-20% of solar power into free and clean energy, provides more power to charge your devices. Ultra-portable: Foldable design (13.19×9.84inch folded / 40.55×9.84inch opened), compact size allows easy attachment to backpacks,tree or tents.Lightweight (51.15 oz) and ultra-thin design (0.98inch folded and 0.2inch opened) make it ideal for long treks. 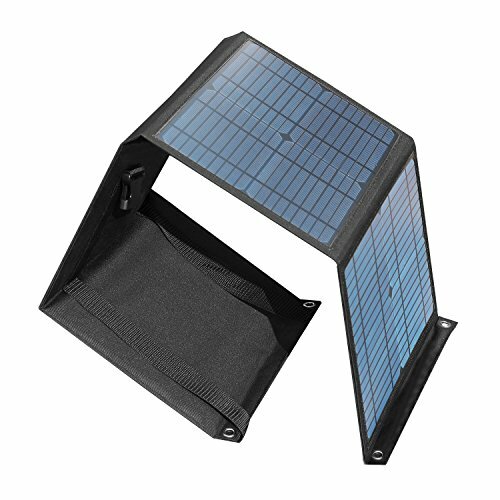 Incredibly Durable:The solar panel are made of 4 Monocrystalline silicon and polyester cloth, offer weather-resistant and outdoor durability, ideal for camping, climbing, hiking, picnic, etc. Versatile Use:18V DC output works with Chafon UPS Battery.5V USB charge GPS Units,iPhone 7/7Plus 6/6 Plus 5S 5C 5 4S,iPad Air Mini,Samsung Galaxy S5 S4 Note Tab,Nexus,HTC,Motorola, Nokia,Gopro and more phones and tablets. If you have any questions about this product by CHAFON, contact us by completing and submitting the form below. If you are looking for a specif part number, please include it with your message.